With a Metro Redline stop, MARC station and easy access to the Capital Beltway, Silver Spring has a fantastic location bordering Washington DC, Chevy Chase and Takoma Park. Since the late 1990s, Silver Spring has enjoyed a sparkling renaissance with the addition of the Discover Communications headquarters, a bounty of new restaurants, open-air mall and The Fillmore. Established neighborhoods on leafy streets and sleek condo buildings provide a range of housing options. The median sale price for a home in Silver Spring is around $411,000 making it a moderately affordable area in Montgomery County. 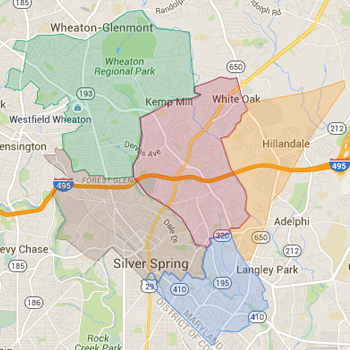 When searching for homes in Silver Spring, include zips 20901, 20902, 20903 and 20910. 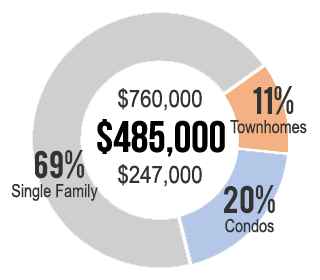 Most homes in Silver Spring are assigned to the Downcounty Consortium. Always verify a home's school assignment directly with MCPS.